Clay Paky Sharpy fixtures proved to be country strong when they turned out in force for the 2013 CMT Music Awards at the Bridgestone Arena in Nashville. 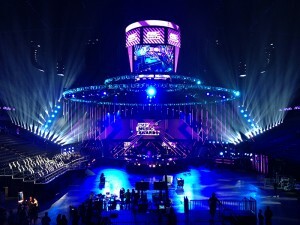 Lighting designer Tom Kenny used a large complement of Clay Paky Sharpys for the gala special, which was hosted by Kristen Bell and Jason Aldean. "The CMT Music Awards is a huge event on the music calendar and gets bigger and bigger every year. It outshines every other awards show," says Kenny. Kenny partnered with production designer Ann Brahic, who marked her fifth year with the show. "She designed a set that was a very modern scape. It went along with the theme of the show: a cross-cultural look at country music," he explains. "People loved it. Ann really understands lighting, and we have a great relationship." Francesco Romagnoli, Clay Paky area manager for North and Latin America, adds: "Mr. Kenny is a great designer and has been a huge advocate of our lights. We’re glad to see them go out on the many high profile projects he designs." VER supplied Kenny with 140 Clay Paky Sharpys for inside and outside the arena. "People are now asking for Sharpys – they really want them," he notes. "I positioned them in the audience for reverse shots and suspended in the air around the set. They are easy to handle, lightweight and deliver a massive beam look – a very distinctive look." The lighting designer opted to use Sharpys for about eight of the 19 performances during the show. "We tried to create a different look for each of the performances," Kenny says. "The Sharpys were a big success. Everybody raved about the show’s lighting."